To assist you I have prepared a new eBook entitled "How To Properly Prepare Your Home For Sale" It tackles the important issues you need to know to make your home competitive in today's tough, aggressive marketplace. 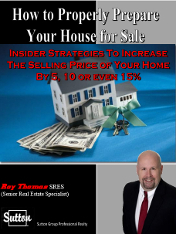 Through this eBook, you will discover insider strategies that can help you increase the potential selling price by as much as 5%, 10% or even 15%! Buyers will be comparing your home to all the other homes for sale. The best prepared homes will sell the quickest and command the highest prices. Having your home properly prepared will enable you to maximize your return. This eBook lays out a step by step process and shows you what to do to ensure your home is in the best possible condition the day it hits the market.